John Glover Roberts, Jr. (born January 27, 1955) is the seventeenth and current Chief Justice of the United States Supreme Court. Appointed by President George W. Bush, Roberts is generally considered a member of the more conservative wing of the court. 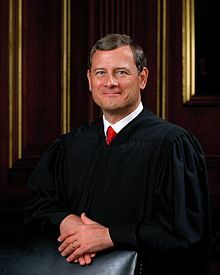 Before joining the Supreme Court on September 29, 2005, Roberts was a judge on the United States Court of Appeals for the District of Columbia Circuit for two years. Roberts has been portrayed as a consistent advocate for conservative principles by analysts such as Jeffrey Toobin. Roberts was originally nominated by President George W. Bush to replace Sandra Day O'Connor as an Associate Justice, but Chief Justice William Rehnquist died before Roberts's confirmation so Bush nominated Roberts to replace Rehnquist instead. Roberts was confirmed by the full United States Senate on September 29 by a margin of 78–22. ↑ "U.S. Senate: Legislation & Records Home > Votes > Roll Call Vote". Senate.gov. Retrieved August 26, 2010. This page was last changed on 2 April 2019, at 05:42.